Conspicuous consumption is a term introduced by the Norwegian-American economist and sociologist Thorstein Veblen in his book “The Theory of the Leisure Class” published in 1899. The term refers to consumers who buy expensive items to display wealth and income rather than to cover the real needs of the consumer. A flashy consumer uses such behavior to maintain or gain higher social status. Most classes have a flashy consumer affect and influence over other classes, seeking to emulate the behavior. The result, according to Veblen, is a society characterized by wasted time and money. This boom has seen a binge of consumption that for the first time human longevity might turn down because we are eating ourselves to death. Death by consumption used to explain a fatal case of tuberculosis, now it could explain the rise in obesity, diabetes and cancers. That is, conspicuous displays of consumption and leisure were the means to demonstrate one’s superiority. Whether you were rich or poor everyone attempts to impress others and seek to gain advantage through “conspicuous consumption” and the ability to engage in “conspicuous leisure”. Consumption is used as a way to gain and signal status. Through “conspicuous consumption” often came “conspicuous waste,” which Veblen detested. Much of modern advertising premised on the “gotta have” society is built upon a Veblenian notion of consumption and rivalry. 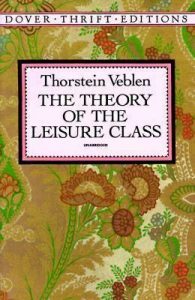 Veblen used conspicuous consumption to depict the upper class that formed in the 19th century as a result of the Second Industrial Revolution. With the growth of living standards and the emergence of the middle class during the 20th century this phenomenon appeared in far more households and individuals whose consumption pattern is governed by demonstrative assets, rather than actual, practical utility. In the 20th century economist Paul Nystrom came up with the theory that changes in lifestyle that came with the industrial revolution led to massive expansion of the “pecuniary emulation.” In the 20th and 21st centuries we can also witness an expansion of conspicuous consumption associated with addictive or narcissistic behavior induced by consumerism, the desire for immediate gratification and a rise in hedonistic expectations. While conspicuous consumption was originally intended as something exclusively for the rich, the latest research economists Kerwin Kofi Charles, Erik Hurst and Professor of Finance Nikolai Roussanova showed that this kind of behavior is widespread especially among the poorer social classes and emerging economies. Issuance of wealth on display in these groups serves to conceal the impression that the person is poor. An example would be the use of oversized jewelries by low income groups. Also, during the 2011 riots in England, when shops were vandalized, high-end electronics and high-end fashion stores were robbed. 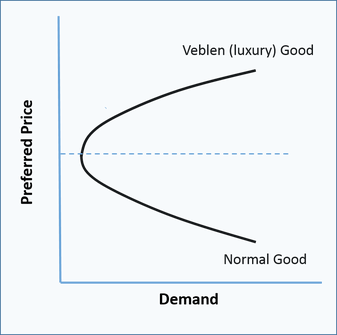 Veblen goods are luxury goods, and operate outside the boundaries of income effect, and there are many examples in the wine world. A Veblen good is one for which demand increases when the price rises: behavior that goes against the flow of commonsense and common buying behavior.